1 Live on purpose A sense of purpose brings the greatest of life satisfaction. According to research people with a sense of purpose are happiest, they live longer and even make healthier life style choices (diet and exercise). How do you find a sense of purpose? Ask yourself: What do I care about? What energises me? What am I doing when I am happiest? 2 Plan for happy times Don’t hope for a happy future – plan one! Ask yourself: Will this make me happy? Going to yoga, visiting a friend will make us happy but we watch TV… plan and do it. Choose what you do for the right reasons. 3 Stop comparing We all do it. The trick is to catch yourself doing it and remind yourself of what you are doing. Do you post the least flattering photo of yourself on social media? Tell a stranger how stressed you are? You are presenting this to the world. Ask yourself: Is that envy inducing friend who seems to have it all really that secure and happy? He or she might have lots of worries you don’t even know about. 4 Count your blessings Our outlook is what we see. Our brains have a built in negative bias to spot potential threats. It is to keep us alive not to make you happy. We therefore need to consciously notice the positives. I often tell clients to look for 5-10 positives everyday. Ask yourself: Make a note of 5-10 things that went well that day. What made you smile? What did you achieve? Read over these the next day and days when you feel low. 5 Wear your heart on your sleeve Feeling upset about something your partner, boss or acquaintance has said? You might think it better to keep quiet, not make a fuss but this can backfire. Next time you are upset, let it all out – write a letter you never send and talk to them calmly when the anger has passed. Ask yourself Also, never suppress a generous impulse – tell someone something positive – tell them they are great, tell them now! Rather than wearing them down with digs and reminders. Set time aside for a bigger conversation and tell them why it matters to you and the advantages to them for helping. 7 Worry less We have evolved to anticipate threats and because nowadays most of the threats we face are not life threatening – being on constant red alert isn’t helpful. Constant worry can become toxic if left unchecked. A distracting alarm in your head making it hard to focus on what you are doing and simply enjoy the moment. Ask yourself Worries are only useful if they alert you to potential hurdles – which you can plan for and act on. If it is beyond that seek help. If you worry about money then seek help from a financial adviser. 8 Get things in perspective The day from hell – train cancelled, late for work, forgotten train/bus pass, it starts to rain not dressed appropriately… We are all prone to a spot of drama! Catastrophising leads to becoming stressed out with hormones that makes us feel like we are living in a war zone. Ask yourself The next time something goes wrong – try re-framing. Remind yourself that missing the train is annoying but not the end of the world. This will pass. 9 Be here now Mindfulness. Close your eyes to really taste your food. Try using all the senses – grounding techniques. Ask yourself you are waiting for a bus rather than reach for your phone to kill time savour the moment and notice your surroundings. 10 Don’t take things too personally If you are going to achieve anything in life you are going to achieve some critics along the way. To avoid criticism – do nothing. So roll with the punches and remember that you are going to pick up a few bruises when you are participating in life. Ask yourself Do you want to love the live you life? 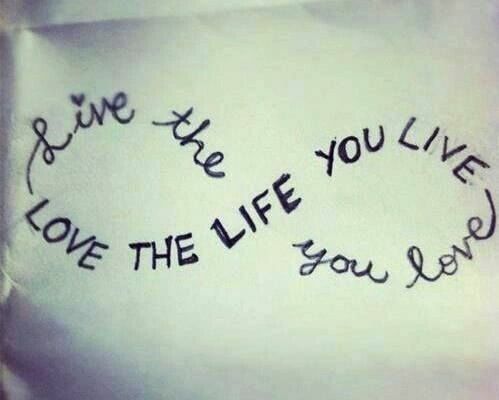 Then you need to live the life you love!